Design Anthology: Hi Patricia, it's great to meet you and welcome to Hong Kong! Your work spans architecture, design, interiors and furniture. How do you find the experience of working across all these disciplines? Patricia Urquiola: I think for me, it was what I grew up with. I studied architecture at the Polytechnic University of Milan, which was a mix of design and architecture, so it was quite natural that these subjects should be together. I was the type of young person who really needed to get out of her comfort zone and I think my background in architecture gives me a special point of view into my design work. More and more, we’re in a kind of ‘non-referential’ world and we need to find new ways to rewrite the rules. We have to wake up every morning rethinking the way we do things – with my clients, I question why we might still use a raw material that isn’t very sustainable, why we can’t change a process or why we don't upcycle materials. I love the word ‘upcycling’; we have to re-educate ourselves and introduce upcycled materials. 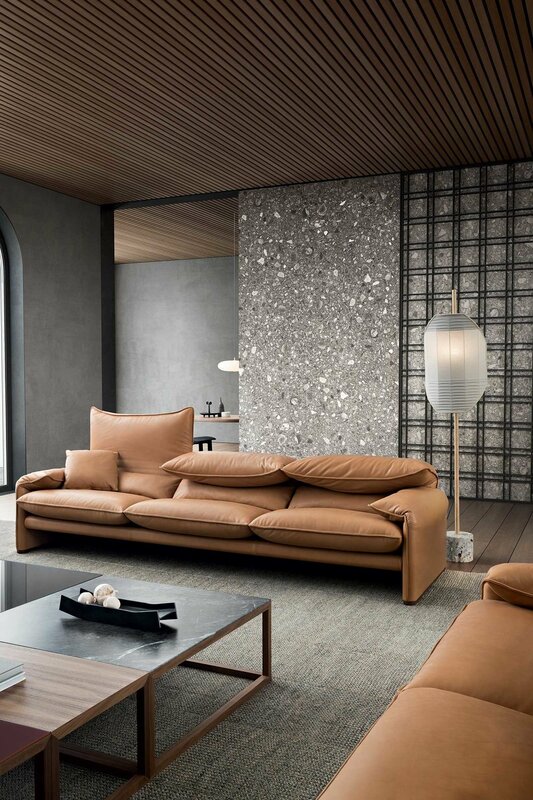 I have this new kind of leather (she pulls a small piece of this ‘leather’ out of her pocket and shows it to me) which isn’t actually leather – it’s made from apple skin, and we used it for a sofa designed by Philippe Starck. And aside from apple leather furniture, what else are you working on? I’m currently working in hospitality; hotels are always in crisis in some way because they try to look like they’ve solved everything, but they know people are always evolving. I'm also working in healthcare making nicer spaces for people who are suffering from cancer. I’m working on the future of offices in America, rethinking the 9-5 structure, cubicles and so on – the solution isn’t just designing a chair anymore. And I'm working in ceramics, which is today very advanced technologically, in marble, wood and new recycled materials. Many people who come to my studio say ‘We know you’re an empathetic person and you’re going to be open. It’s new for you too, but we know you’re going to find a solution.’ They know that I'm not just going to choose something that exists already. That's good because we’re in a continuous laboratory of connection. My work is trying to be a catalyst to connect my culture and my point of view. I think you learn a lot from mistakes, and we’re living in a very interesting moment. I like to work with people that I like and I'm always pushing the limits. I'm a person who is never happy enough, this comes to me very naturally – it’s an Italian thing. What about your art director role at Cassina? I’m lucky to take care of Cassina. Being inside the company is very interesting because it’s more than 90 years old and it has always been about the idea of progressive design. If you do a couch, do it in an industrial way – they invented this kind of attitude. We’re really trying to look at the company with an open mind towards the future. The company is quite complex because of its long legacy. We have to keep a process of looking into the future while also rethinking all our masters of design. We’re continuously looking back into the archive, and speaking with new designers, and my job is to be open to these kinds of interconnections and crossovers. We have to rethink the materials, for example the Feltri chairs project we did with Raf Simons was an interesting way to look at our pieces from another point of view. As an architect I think about the spaces where we introduce our pieces, and how to make them evolve in a social, aesthetic and material way. How do you introduce iconic designs to a younger audience who is perhaps unfamiliar with them? We just had an Achille Castiglioni exhibition at the Triennale di Milano, which exposed the millennial generation to one of the most important Italian masters of design. Achille was my mentor and teacher at university, and I think it was very interesting to do the exhibition with a fresh attitude towards young people, and make them understand without any kind of chronology. After our conversation, Patricia then spoke to a small audience about her work. She shared her beliefs on the importance of breaking one prejudice every day, and how she had broken her prejudices towards marble, a material she is now working more in and how she’s also trying to abandon the idea of gendered design and the design categories of masculine and feminine.